"This is a basic vegetarian pizza that you can tweak to make your own special go-to dish. It's quick and easy and is the meal I plan for those busy nights when I can't spend much time in the kitchen." 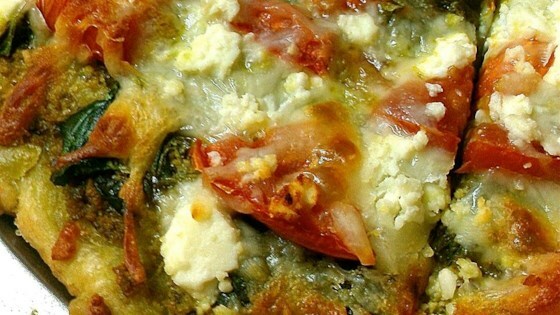 Remove crust from wrapper and spread pesto over crust; top with a layer of spinach leaves, chopped tomato, shredded mozzarella cheese and feta cheese. Place pizza on a baking sheet. Bake pizza in the preheated oven until the spinach leaves are wilted and the cheese is melted, bubbling, and beginning to brown, 10 to 12 minutes. Far too much pesto. Next time I will use half. This was very good, a little intense and I burned my crust a bit which didn't help. I would bake it at a lower temperature for longer next time. easy to modify depending on what's around the house. I didn't use tomato but I did add chicken and frozen chopped onions and green peppers.